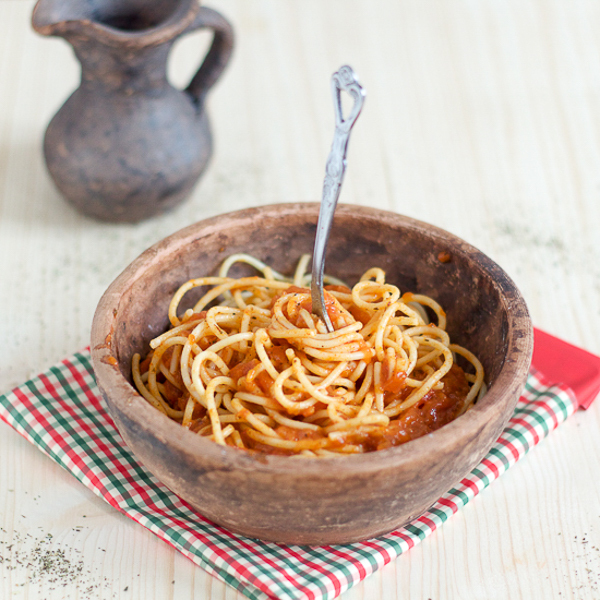 Dalmatian tomato sauce (salsa/ paradajz sos) is one of the simplest recipes for the freshest, most rich tomato sauce you’ve ever tried, coming to you straight from the Balkan coast. It takes 1 hour from start to finish, and keeps in fridge for a few days. 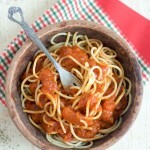 This Dalmatian tomato sauce (salsa/ paradajz sos) is perfect with rice, meatballs and calamari too! 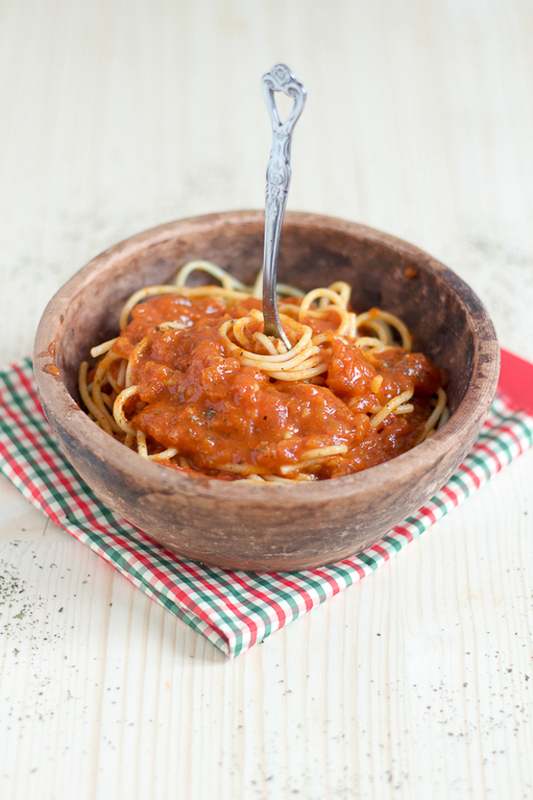 Dalmatian tomato sauce (Salsa/ paradajz sos), a sauce made by long simmering of tomatoes, is typical for the Dalmatian coast where, similar to many different specialties, it arrived by the way of Italy. There are several different ways to make this tasty sauce, and everyone has just the right trick that makes their sauce better than the next one. The way we’ll make it for this recipe is just the way my mother and grandmother made it. I found out my mom’s trick when I asked her to reveal her method to me, to which she said “Recipes are for amateurs. You cook “from your eye,” you start by knowing the taste you’d like to achieve, and you follow what you’re making, you add a little bit of this and a little bit of that, you lick it a little bit to see whether it needs to cook longer, you let it boil a few more minutes, you lick again, and that’s about it.” Regardless, I still was able to get her to put her talent to the paper. 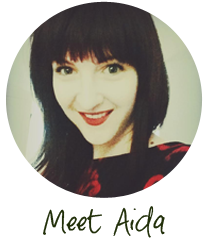 My mother was born in Dalmatia where she grew up until she moved to Sarajevo as a teenager. Even though I was born in a city surrounded by the mountains, known for and by its winter sports, and also as the host of the 1984 Winter Olympic Games, through my mom I learned to love the sea, the Mediterrannean and its culture. Since early childhood, as far back as I can remember, I used to spend long, warm summers by the sea. I remember waking up early in the morning, getting ready, and going to the Sarajevo train station still half asleep and bundled up, because regardless of it being July, it used to still be frigid somewhere before dawn. Then the waiting for the train to take us to Ploče (a port town on the Adriatic, used to be known as Kardeljevo back then; it was a custom in Socialist Yugoslavia to change the names of places or towns with the names of war heroes or high party officials; Edvard Kardelj was a Yugoslavian politician), sitting on a waiting room bench, where I killed the time by swinging my legs back and forth as they were too short to touch the ground just yet. Traveling by the train was a one of a kind experience. Train tracks, generally not built for fast train movement (building of the train tracks from Sarajevo to Ploče was started back in the day of Austria-Hungary), handled ascents, assents and sharp turns that constrained it to a certain speed, affording a great way of meeting natural treasures that clinched together on such a small space. We were getting close. To the sea. I felt it. The air would get a certain freshness, and the smell of the salt washed over us, as if it were some old welcome greeting for the people who don’t spend much time at the seaside. This 3 hour train ride ended at Ploče. When we were lucky, a friend would wait for us with a boat and take us to the other side of the coast. This would cut the trip down considerably, otherwise, there followed a pause of an hour or so, waiting for the bus for Dubrovnik, then a transfer around Stone to another bus that took us to the island of Korčula. A few modes of transportation changed, and some wasted time, but we weren’t in a hurry. We arrived to mom’s hometown on the peninsula of Pelješac in the late afternoon, where my grandmother and uncle could hardly wait for our arrival. Darkness would fall slowly, and I used to watch the sea that spread in front of us from the window of our house, seeing the ships on the other side that waited to enter the port, lit up like a floating city. A long, warm summer awaited me. The magic of living in the Balkans is that everything is there at your fingertips. Moving in a direction of a few hours reveals all the generosity of nature, exchanging one after another belts of pronounced mountain, then continental, and finally Mediterranean climates. And together with them, the influence of different cultures that moved through, staying some more some less on this land, leaving behind seeds that sprouted and grew deep into the ground. Sometimes it’s hard to precisely differentiate where one culture started and the other took over. They exist parallel to each other, one not bothering the other, cohabitating, pushing each other from time to time, and then making up again. Often they come together and melt into each other, like colors on a painter’s pallet, making up a similar one from those that it came from, and yet it’s still its own, authentic. Cut in a small “X” into the bottom of each tomato. Bring half a pot of water to boil on high heat. 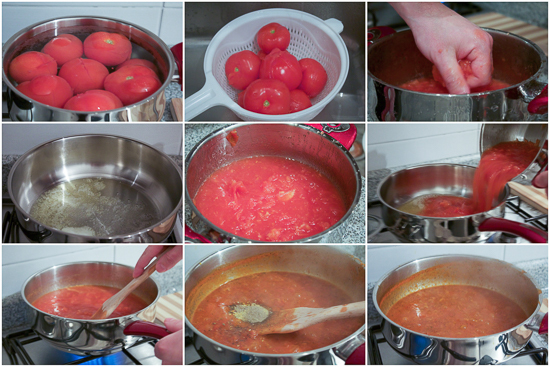 Place each tomato into the boiling water and leave for 1-2 minutes. Take the pot off the stove, and empty hot water. Place pot under cool water for 30 seconds. (You can also use cool water with ice cubes instead.) Tomato skin should be easy to take off now, so go ahead and skin each tomato. Watching that you don’t get burned, squeeze each tomato into a bowl as much as you can. Tomatoes should fall apart on their own. If you prefer chunkier pieces, leave them like this. 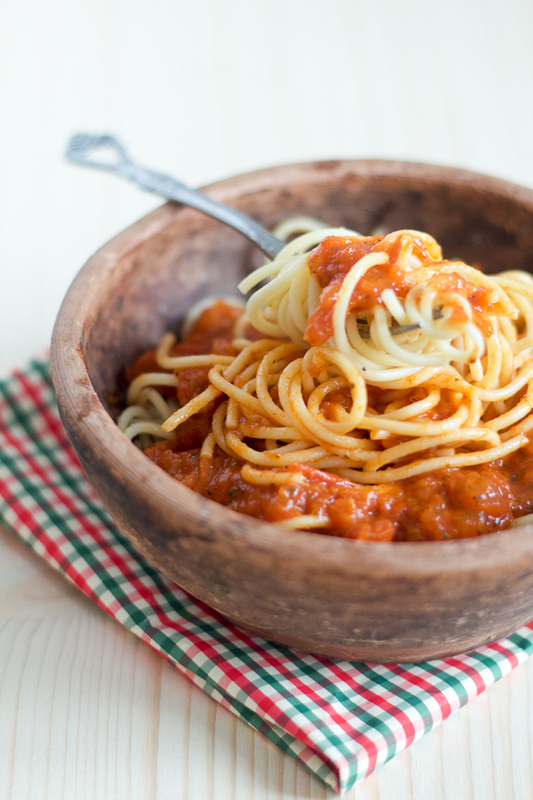 If you prefer a smoother tomato sauce, use a mixer or a potato masher to cut tomato pieces down even more. Warm up the pot in which you’ll be making the sauce. Combine oil and butter, and warm up on medium. If you are using garlic, add it to the pan and simmer. Otherwise, add the tomatoes in start simmering. As you are simmering, start adding the spices, and mix them in. Simmer everything until all the fluid has turned into a sauce, or about 35-40 minutes. Serve over rice, spaghetti, other pasta, or French fries. The sauce is perfect to use for pizza as well. Keep in fridge for up to a few days. What a beautiful dish! I love when simple ingredients become spectacular dishes. I’ve visited Italy a couple times but never got to the areas that you spoke of. I really enjoyed your description of traveling by train. I enjoyed traveling by train too. Thank you Julie! I’ve noticed you have some great recipes with simple ingredients. This part of the world described above is in Croatia which neighbors Italy – well worth a visit next time you are in the area, especially if you like the beach. This was so delicious! I made it this afternoon and just like you said, it really did take exactly one hour from start to finish on my first attempt! 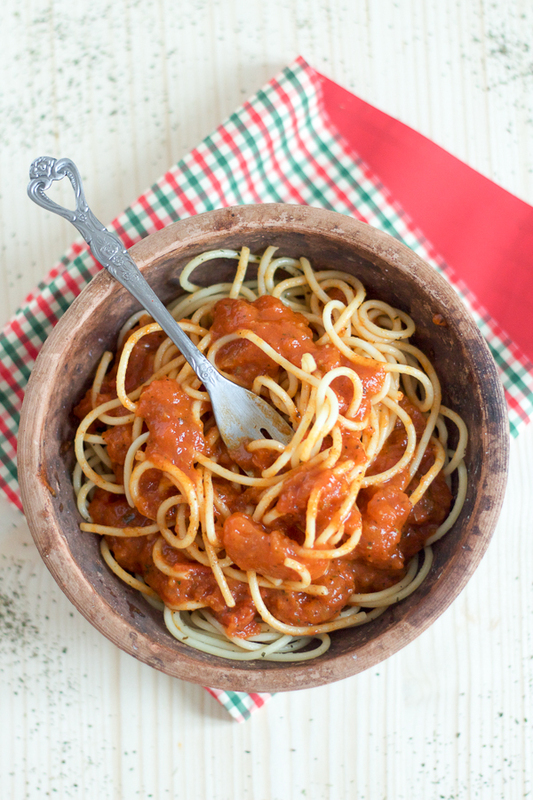 This sauce recipe is WAY better than anything that comes out of a can or jar; you can really taste the freshness and sweetness of the tomatoes. I served it over spaghetti and it was wonderful 🙂 I can’t wait to try the meatball recipe next! Not this time! 🙂 I made it exactly as written 🙂 It was so nice and easy! This was delicious! Such a wonderful light sauce for pasta. Perfect use of summer tomatoes. Thanks Tara! Glad you liked it. I love the way you describe the trip from Sarajevo to Ploce. I was once young and traveled like that from BanjaLuka to Sibenik. I remember the first breath and aroma of the sea… Best regards to you. The story was written by my friend. He’ll be happy to read you enjoyed it. But yes, nothing like that first hit of aroma as you reach the seaside.